Focusing on the idea of difference as a marker of subalternity, this book looks at the ways in which ordinary citizens have sought to present and identify themselves in ways that defy the conventional categorisations of governments and historical experience. Inspired particularly by questions arising within the feminist movement, chapters examine the ways in which liberal democracies are able to accommodate and live with difference. The reader is encouraged to question normative ontological conventions of society and politics, as well as question some of the revolutionary ideologies which have sought to achieve radical change in the societies concerned by encouraging people to identify with particular class interests. The book goes on to analyse the concept of the Subaltern and the meaning of Subalternity, insisting that it should be understood though action and self-identification in relationship to repression, rather than as an abstract academic tool of analysis. The book marks a new approach to the study of disenfranchised and minoritized populations, challenges simplistic pronouncements of ‘difference’ based on culture rather than politics. It is an essential read for students and scholars of History, Anthropology, and Colonial and Postcolonial studies. Pandey, Gyanendra. 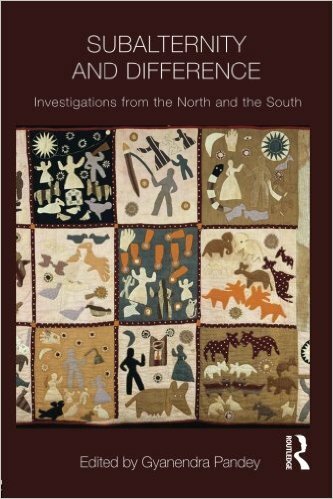 Subalternity and difference : investigations from the North and the South. London New York: Routledge, 2011. Print.